In his earlier years, Spence performed in a lot of speed and halter classes. His previous owner, Katie, learned about Spence through a friend. Katie ended up purchasing him on Christmas Eve, and what a great gift he turned out to be! Spence would follow her everywhere, so Katie didn't even need to use a lead rope with him. Spence bonded immediately with Cricket, the horse belonging to Katie's sister. Katie described Spence as being 'bomb-proof' because, while he was being ridden, nothing at all seemed to bother him! The only thing Spence took issue with was cows. They seemed very foreign to him! Whenever spotting one or more in a nearby pasture, Spence would kick up his heels and run around. In February of 2008, Cricket broke her leg and had to be put down. That day Spence lost his only friend and Katie was concerned for him. She was thrilled to find Sunrise Horse Farm. Spence made plenty of new friends - human and horse alike! - which made him a very happy horse once again. 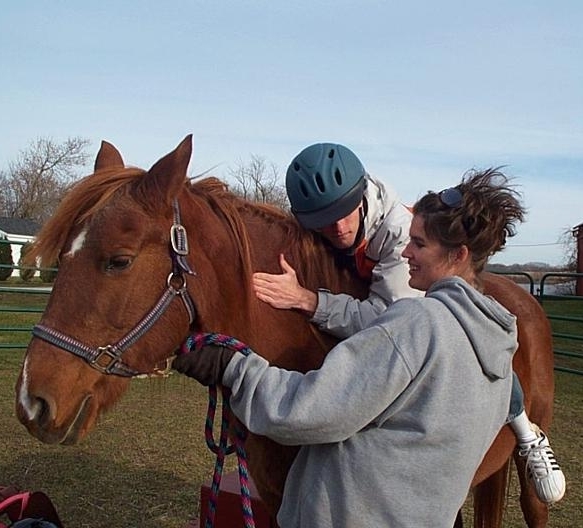 The following was written by the Rabione family, who donated Ginger to Sunrise Horse Farm. 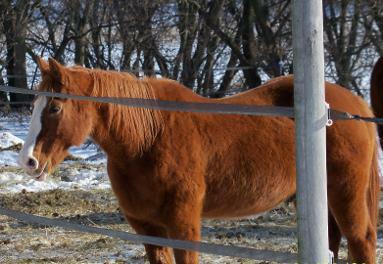 Our family will never forget the decision to give Sunrise Horse Farm our girls, Ginger and Amber. We know they both made a difference in many lives. We started looking for a horse for our daughter, our original intention was only to buy one. However, in the back of my mind, I was really worried about her riding alone. So we brought Ginger and Amber home on April 28th 2002. We soon found out that both Ginger and Amber loved sneaking out into the rain and snow! Ginger's registered 'barn name' was Quasar Bar Punk. We made sure to change that right away! Then came the day our next door neighbor was leaving for work and saw either Ginger or Amber standing in another neighbor's front yard. It was then we discovered both of the horse's weakness for oats, and from then on we would put some in a bucket. All we needed to do in order to get their attention, was give the bucket a good shake! In 2007, Cassie started getting a little too busy to be able to take proper care of Ginger and Amber. We as parents weren't sure what to do, but talk about divine intervention! In the paper that day was a front-page article for Sunrise Horse Farm, which at that time had just started operating. 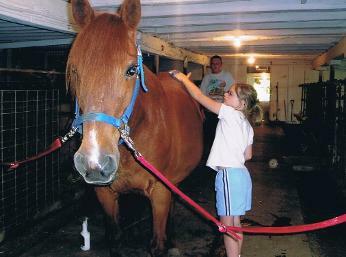 The article started that Sunrise Horse Farm was intended to help kids in need by pairing them with therapy horses. We couldn't imagine a better place for Ginger and Amber to go! They would both be cared for and loved, as well as ridden. Not to mention they would get the chance to help someone in need! Ginger and Amber turned out to be the perfect fit for Sunrise's needs.